close to the results from earlier in the week with a 361 average watts (364 previously. Actually didn't feel that strong. Didn't have lunch and attended my wifes retirement party so I stood for two hours (well worth it!!!) Anyway, 370 can be done. Did these today with the idea of doing both of classes tomorrow, taking Thursday off and then doing the 20 minute time trial on Friday. I was a little tired after yesterdays tt and last nights circuit class but still averaged 455+ on these. Not sure I can get the leverage on the indoor bike that I do outside to get up to 500+. I took yesterday off so I decided to do the time trial effort today. I want to fit in the 10x1's and second tt effort before I leave for California. I have to say that I was thinking of dividing this into 4x5 minutes or 2x10 since it was inside but once I got going I went for the full 20 minutes. Average power was 364 at 88 rpm's, 27.5 mph. I'd say that's pretty close to my outdoor power for that time, or close to my Cleves tt effort. That may be the best 20 minute that I've ever done inside. The Stages SC3 really works well. I can hone in on the cadence and power unlike the CycleOps Indoor 400 where my rpms kept dropping into the 70's. Great ride today with Sean and Brett. 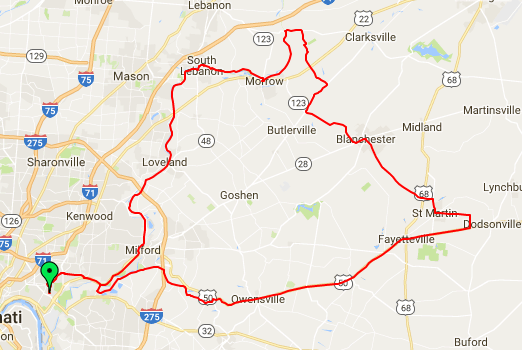 We rode in Hamilton. Clermont. 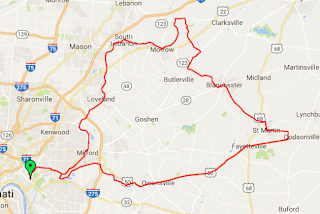 Brown, Highland, Clinton and Warren counties over the course of the 102 miles. Same course as Tuesday. Held 518, 518, 519, 500, 509, 501, 510, 508, 497 and 489 for a 507 average. An overall 10 watt drop on the average but pretty minuscule in the scheme of things. This ride is a great illustration of the difference between average and normalized power with 162 being the former and 331 being the latter. In the 60's and not raining so I hit the crit course to do these. Felt pretty strong: 511-530-525-524-509-519-530-507-509-513, or 518 average. Looked back and found the same efforts from last April 29 averaged 505. I have a few more sets of these over the next two weeks so will attempt to build on them. Hotel gyms....better than nothing but not by much. Riding a LifeFitness bike with the bike motorcycle saddle that is set much to upright relative to the pedals and bars just isn't much fun. I'm doing 60-75 minutes per day along with 30 minutes of strength training and plyometrics. The latter is actually more than I would have done at home so that is a good way to make up for the inadequate bike situation. Overall not anticipating any loss of fitness on this trip. Given the all day seminars (8-5, M-Th and 8-12:30 on Friday) I'm not eating much. And they food they've provided has been wonderful: yogurt, fruit and bacon in the am, steak, turkey and fish at lunch along with steamed veggies. Plenty of other options to cheese from but this is what I've been sticking with. Had some time late in the day so I did another hour at 215 watts. I may go longer than 2 tomorrow. It'll be inside as we're in the single digits for lows and teens for highs. I'll find out on Sunday what kind of bike access I have in Del Mar, CA either at the hotel or the local gym. They did mention on the website for the hotel that there is a club within the 5 mile free shuttle range. I know I'll be up early given the time change so one way or another I'll be working out. And a light week won't be bad. I'm feeling strong and not really too tired unlike other winters where I've been inside for weeks. I'm already getting excited about the June races at USAC masters in GA and Senior nationals an AL, all within 6 days. Does Sitting Hurt Super Fit People? Saw these on the schedule and was looking forward to them...and hey didn't disappoint. A total of 18 efforts in blocks of 6, 45 seconds each with 15 off, 5 minutes between the sets of 6. I subbed the 8:15 am spin today and we did a lot of 30 second, 1 minute and 3 minute efforts. Power was 500+, 400+ and 300+ on these. At lunch I hit Ault Park for some intervals of 5x1 minute and 5x30 seconds at 515, 528, 531, 511 and 520 followed by 637, 627, 621, 615 and 602. Will be doing my 55 minute strength class later today. Looks like i have 6x45 seconds, 15 off x 3 sets later in the week. Fun!